Preparing all the materials for reinforcing the internal chines. One layer of 50mm, covered with 75mm and laminated with peel ply. Laminated half a chine. Completed all the internal fillets. I also added a length of Kevlar at the stems on the partiality cured fillets as I thought it might be easier in the long run. I used masking tape to define the edge which I removed when the fillets where partially cured. This worked well apart from where the tape ripped close to the fillet and I left as I did not want to remove as it risked disturbing the fillet. 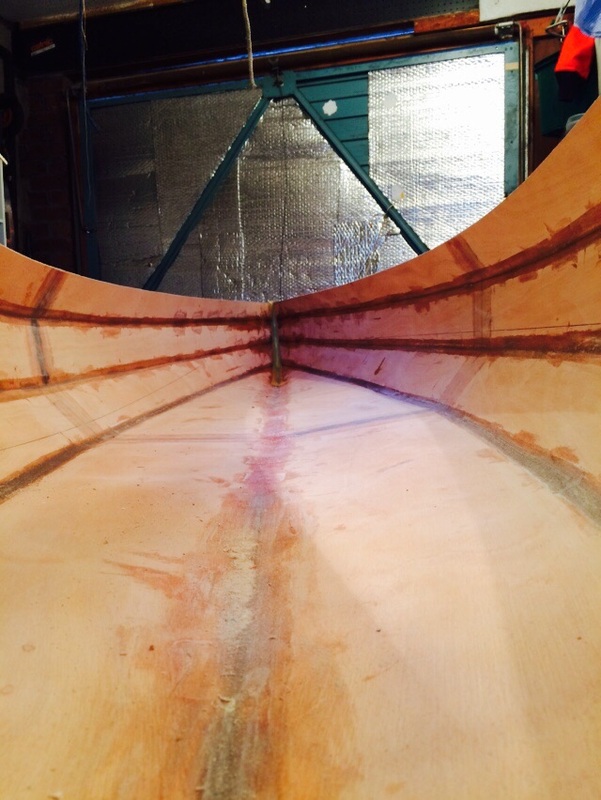 When the fillet had set the tape was securely bonded to the ply / epoxy. There is a big case for pre coating the panels. 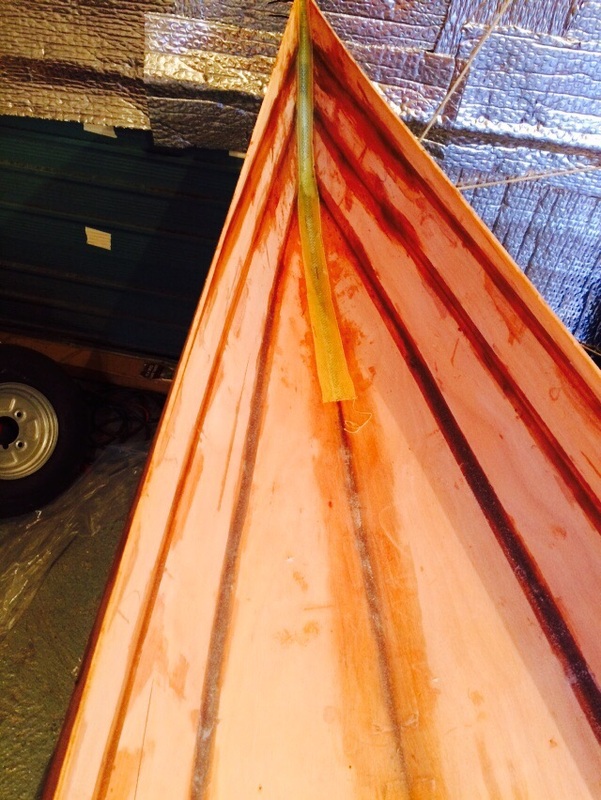 Just an hour on the canoe adding some fillets. Went and did the Wednesday race in the Streaker. Heavy rain before the race and nice steady breeze, start sequence and a storm comes from nowhere, within minutes there are breaking waves and many capsized boats. Was doing well until I added an extra mark into my course, but still finished without incident. Was a fantastic sail. Have cleaned the inside ready to complete the internal fillets. 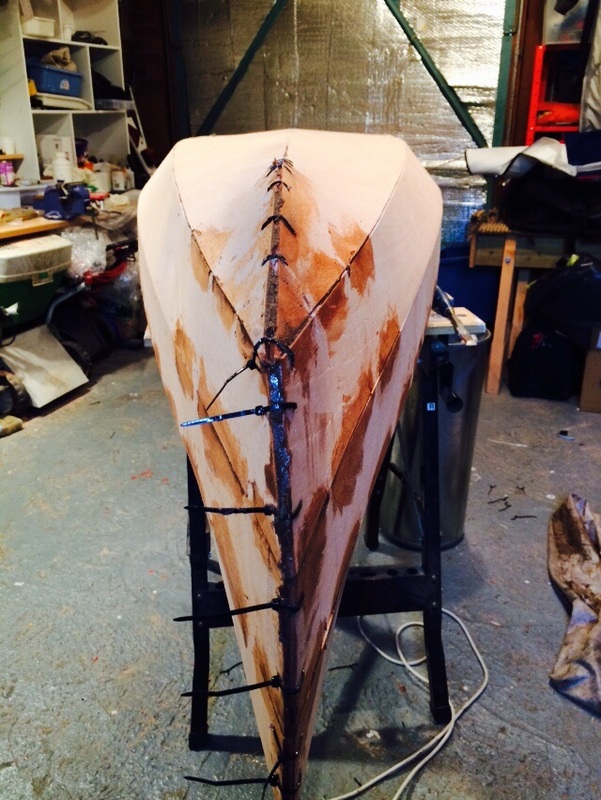 Then using syringe with light filler plugged all the stitch holes and fillet the keel area. Also found some carbon cloth that will stiffen up the whole bottom area. It will be in the inside from 700mm from each end. 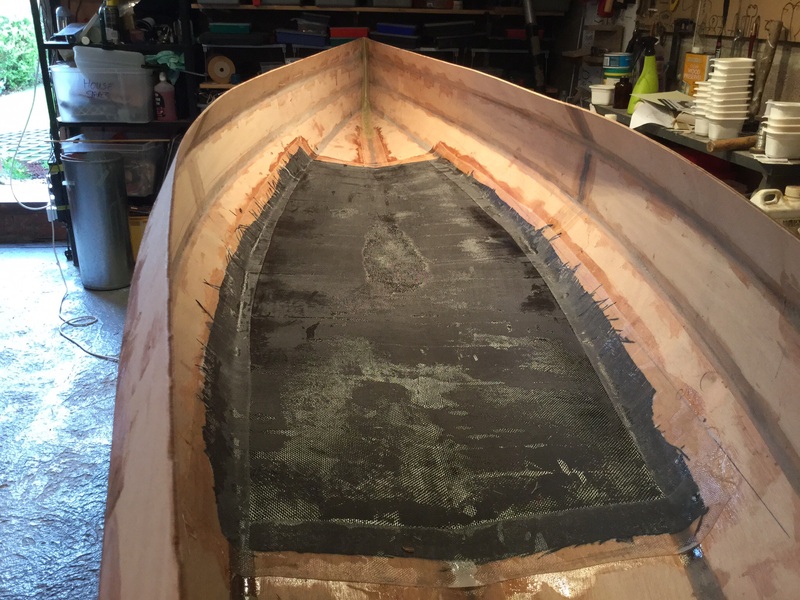 Only half an hour on the canoe today, re-glassed the poor seam and did a bit of sanding, some without glass paper which caused a nasty cut. 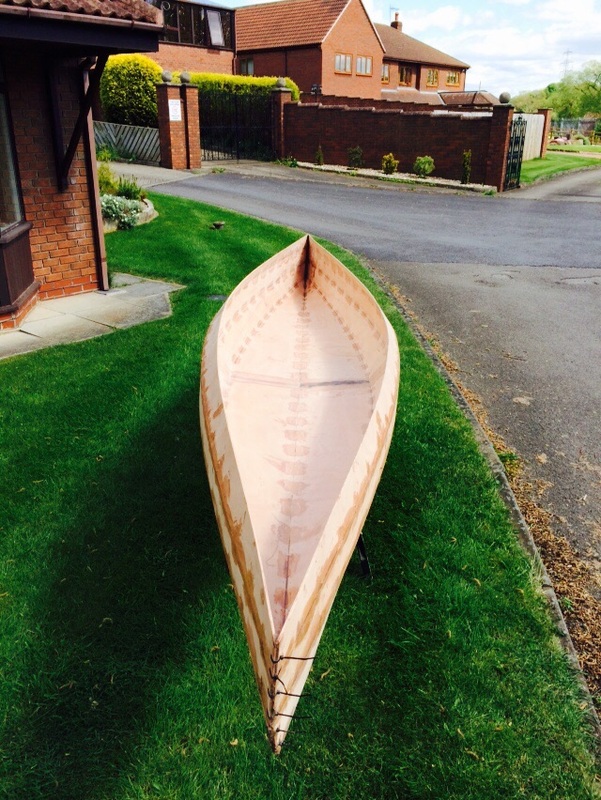 3 hours on the canoe 3 hours sailing, happy days. 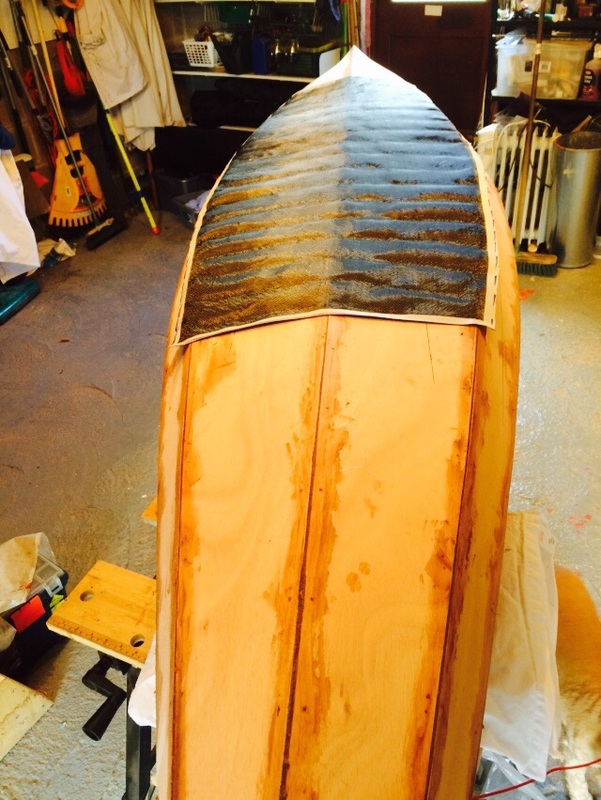 Removed all the tie wraps, turned her over and fill / bonded the remaining external seams. One seam, about 6 inches near the bow, had shifted and I was not happy with it. Considered filling the fault but finally decided to cut through the epoxy and I will reglue next time. Other than that I am very pleased with the shape of the hull, looks very good in my opinion. 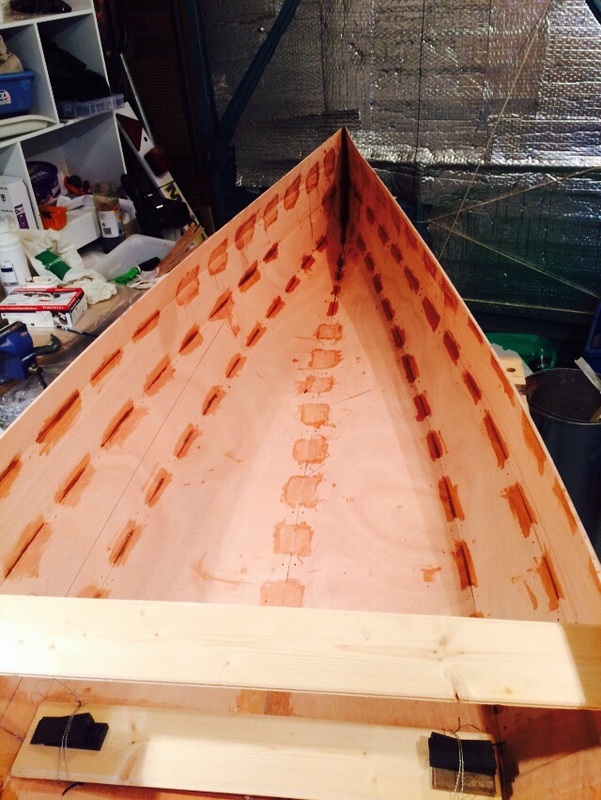 Now I have a stable hull I was able to weigh her 7kg, I still have plenty to add but 7kg sounds encouraging. On the down side West filleting powder and epoxy make the hardest substance known to man and I see a lot of sanding in my future. So after that up to the Dam and three races in the Streaker in a gusty F3/4, kept upright and happy with my performance though still mid fleet and can’t catch the old hands in newer boats. 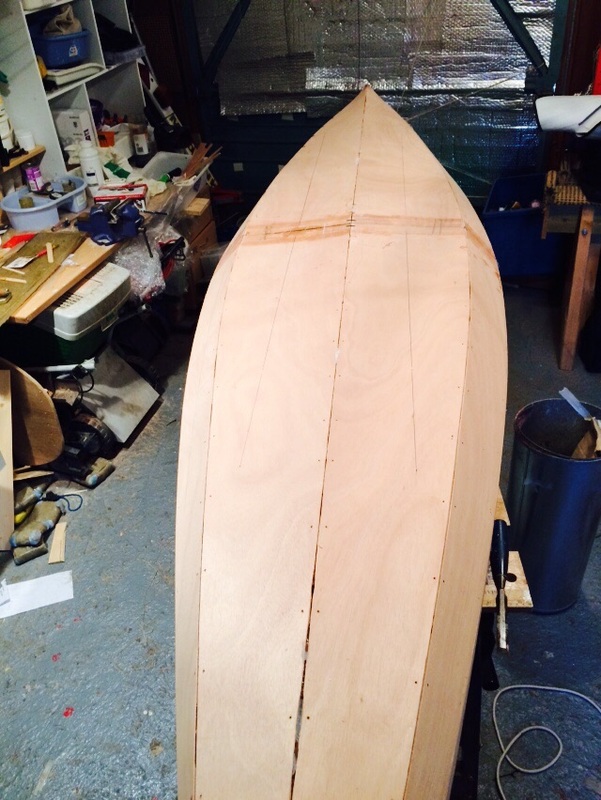 I am getting better and have an old wooden, heavy, boat, excuses, excuses….